Hondurans are facing a political and human rights crisis with the ongoing counterinsurgency tactics of U.S. trained and financed security forces, and with the crackdown on organized resistance to extractive projects. Still, Honduran communities and movements continue to build collective resistance, against the odds. Phil Josselyn (CISPES, Committee in Solidarity with the People of El Salvador, and just returned from a delegation to Honduras) will discuss community organizations fighting dam projects and violence against them, following the killing of indigenous leader Berta Caceres. At the night event downtown (6:30-8 pm at T.C. Workers Center, above Autumn Leaves Bookstore), Patricia Rodriguez will join Phil to discuss the so-called post-conflict situation in Colombia and how Colombians continue to endure criminalization of social leaders and assassinations. What lessons can we draw from collective resistance in these two countries? 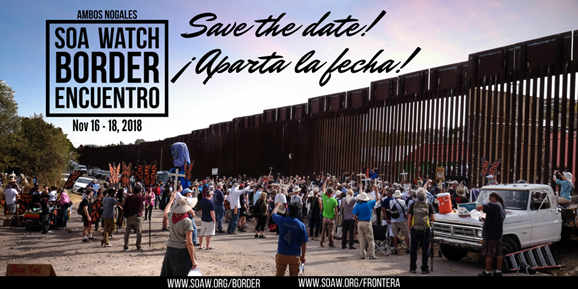 This event is in advance of the 2018 Border Encuentro in Nogales, AZ and Sonora, Mexico, organized by the SOAWatch and which brings awareness to the connections between U.S. policies toward Central, Latin America, and elsewhere, and migration. Sponsored by Tompkins County Immigrant Rights Coalition and Latin American Studies Minor Program, Ithaca College. Poster-Cine con Cultura Film Festival 2018 starts next week!